I have been working on the script to an American-style police show set in the Netherlands. It's called “Leiden is my beat” (or maybe “The mean streets of Leiden”the title should reflect somehow what Leiden means in German, and what lijden means in Dutch). The title will come to me eventually, but let me tell you the story line. 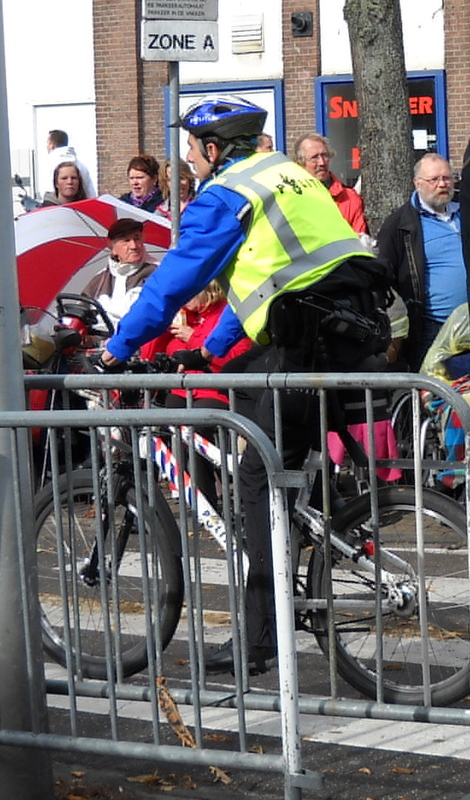 The main character is a very tall blond policewoman with a pony tail who rides around the cobble-stone streets of Leiden on a bicycle. She is so tall that her knees keep bumping the handlebars. (I thought that was a nice touch of realism.) In the first episode she sees someone stealing a bicycle. Knowing that she has no chance of catching the thief (because of her knees hitting the handlebars, you see), she has to come up with some other method of stopping the crime wave. Fortunately, she knows the owner (now the former owner) of the stolen bike, so she races to the owner's house to give him a ticket for failing to have a proper lock on his bicycle. On the way to delivering the ticket she stops to help an American tourist find her way back to her youth hostel after a long afternoon in a coffeeshop. Naturally, the policewoman and the American tourist girl fall in love. This complicates things a bit and causes them both a great deal of misery. But as luck would have it, when the policewoman remembers to deliver the ticket to the bike owner and is just about to press charges against him for his criminal negligence resulting in tempting a bicycle thief, the owner of the bike turns out to be a Buddhist, a disciple of a tulku named Steven Seagal. The disciple gives the policewoman a DVD of Steven explaining the first noble truth while doing some nicely choreographed kung-fu moves. When the policewoman and her American lover see the DVD and hear the dharma proclaimed, their hair spontaneously falls out and their clothes turn orange, and they realize they have miraculously become Buddhist nuns. So they decide to feed themselves to a starving orphaned swan swimming forlornly in the canal near a windmill. I'm pretty sure this TV series will be a big hit. I hope to find a Dutch or Flemish actor who will consider playing the part of Steven Seagal. Ideally, of course, it would be Gerrit Wellens.